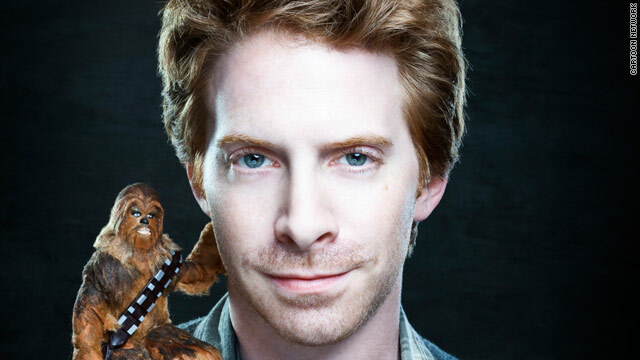 Seth Green's show "Robot Chicken" has included three "Star Wars" specials. (CNN) -- Know who's one degree away from Kevin Bacon? Thanks to the new season of "Robot Chicken," it's Seth Green. Green, known for playing characters that make a lasting impression on pop culture (like Oz from the TV series "Buffy the Vampire Slayer," Scott Evil from the "Austin Powers" movies and Chris Griffin from the irreverent animated series "Family Guy") has found critical acclaim with "Robot Chicken." The stop-motion animated series he created with Matt Senreich won an Emmy last year for Outstanding Short-Format Animated Program and has earned Green multiple nominations for his voice work. Their "Star Wars" parody/tribute specials are endorsed by George Lucas. CNN: You're pretty much cornering the market on stop-motion television. How hard is that? Seth Green: The show's tricky. We do 20 episodes in a year, basically. It's 11 months from the time we start doing our writing to the time we deliver our post [production]. This year was longer because we folded an hourlong "Star Wars" special into the middle of our production, so it will wind up being 15 months when it's all over. It's a long, long process. But we love stop-motion, and it's a really communicative medium. It looks just like film, and you see real shadows, and you see light and your brain registers something that's tactile that you've maybe interacted with. That helps you to believe that what's on film is actually happening, which makes it funnier. It's a medium that's rarely used for comedy, and I think that's a mistake. CNN: Are you debuting any new action figures or characters this season? Green: We got some Charlie Brown, some Harry Potter, some He-Man. Gobots, Matrix, Avatar, Buck Rogers, Transformers, RoboCop, it's a good one. Oh! The "Back to the Future" -- I don't want to tease this too hard because it's so late in the season, but we have a "Back to the Future" crossover with Jay-Z ... it's not the real Jay-Z. It's pretty cool, we got Christopher Lloyd to do it. I'm really excited about this season. We had Jon Hamm, Bryan Cranston, Kevin Bacon, Megan Fox, what a crazy year! CNN: Do you ever have any guest "cluckers" on the show? Green: In the closing credits? We've never re-recorded that since the first season, except for "Star Wars," and it was all the same people. In our post department, when Chris McKay was editing the show before he was directing it, he came up with that song and got everybody together to cluck it, and we've just kept it. No one's ever asked for that! CNN: How awesome is it, knowing that George Lucas likes your work? How hard is it to control your fanboi around him? Green: It's crazy. It's crazy stuff. We're getting to work with him now on this new animated thing, and get to spend time with him actually writing stuff, and it is one of the more surreal experiences I've ever had. CNN: Who's your dream "Robot Chicken" guest star? Maybe we can help get that out there. Green: We've been targeting Harrison Ford pretty hard for a while now, and whenever people ask us who we're trying to get, we always go after him. Just because eventually he's going to hear it and either think we're so obnoxious that he's going to tell us to f*** off or he's going to come do the show. CNN: What are your thoughts on the new Buffy the Vampire Slayer movie that's in the works (and does not involve creator Joss Whedon)? Green: I saw that Joss wrote that open letter. Let's be fair, all he really said was, "Hey, this isn't even 10 years old." Are we really at the place where we're remaking "Two and a Half Men"? Is that really still on the air, and we're remaking it? And where is the need for that other than some kind of capitalizing on a trend. You know, there's no public outcry for a remake of Buffy, there's only the opportunity in pop culture where vampires are very popular. If Joss came out and said, "I want to make a new Buffy movie," even if he said, "I want to do it like the reboot of Spider-Man. I want to put Buffy back in high school and I want to tell a different story with this character," I think people would go with that. But the fact that people who are not connected to it and were not connected to the show or any of the mythology that was created going back to the movie -- which everyone kind of agreed wasn't a perfect version of its potential -- you know, I think that really confuses people. It confuses the audience. They're like, "How am I supposed to feel about this?" CNN: Will we see you work with Whedon again anytime soon? Green: I have told Joss, publicly and privately, that I will do anything for him. Everybody that worked on that show gave me some of the best material I've ever gotten to work with. I'm super grateful for that experience and that opportunity. CNN: Are you a nerd or a geek, and what's the difference between the two? Green: Typically, by definition, nerds are interested in things that are not mainstream and may be subculture -- but subculture with usually a mythical bend or mathematic bend or scientific bend. So nerds are typically interested in subculture things that have to do with science or wizards or superpowers. Whereas geeks, I guess, usually tend to be the extreme version of that, where they're less able to relate to actual, other human beings that aren't interested in the same thing. Like geeks tend to be so focused and consumed with their subculture interests that they are incapable of communicating or interacting with other people; i.e., leaving the house or making dates or having social engagements. Do you know the difference between a nerd and a geek? Matt Senreich: I'm sorry, I don't mean to interrupt. Green: No, no, no, let's hear it, you might be an authority having dealt with ... (to CNN) This is Matt Senreich, who before I stole him away to make "Robot Chicken" was the editorial director for Wizard Publications, which in its day had five different banners that Matt was in charge of, including "ToyFare" and "Wizard," which were the premiere genre magazines for both toys and comics. CNN: Matt, we love your nerd pedigree. Senreich: All right! I just disagree with that [nerd/geek] definition. We always said that geeks were more into the pop culture subculture, if you will, whereas a nerd was more book-smart. Green: So define that. So the geeks, you're saying, are into cosplay and D&D? Senreich: Geeks are into what is considered pop culture [as if it were] a science, in a sense, where they know all the little intricacies that nobody else would pay attention to. Whereas a nerd is more book-smart, and is the guy in math class who can answer a million different scientific equations. That was the definition we always used at Wizard. We always catered to the geeks, and the nerds would end up reading if they wanted but may not. Nerds are more high brow. Green: A slight difference of opinion here, a yin and a yang, if you will.